This post has been featured on This Week in Spring – October 13, 2015. Stéphane Nicoll, working at Pivotal, using Spring since early as 2007 and creating Spring Boot with others since 2014 came over from Liege for the third talk at Aachens EuregJUG this year. The idea of the talk was using http://start.spring.io to get a Spring project up and running as fast as possible. The starter is actually the only generation of stuff there is: It generates a Maven or Gradle project configured to use Spring Boot Parent and all starters you selected. Everything after involves no generation. The starter generator is actually itself a restful Spring Boot application and accessible via CURL, Web and REST endpoints. The REST endpoints are actually used by IntelliJ IDE or STS IDE for nice GUIs generating projects as quick as possible. What i didn’t know: They’ve also enabled the actuator endpoints, for example the metrics. Nice to see, how the site is being used. Stéphane showed us how Spring Boot takes opinionated decisions about configuring stuff and how it stays out our your way if you want something else by using security as an example. One cannot stress this enough: Nothing is generated, it’s just configured and for me, thats one of the greatest thing about Spring Boot for since i’m using it as early as version 0.5. Another important point was the fact that Spring Boot incorporates the Spring IO Platform, a curated list of dependencies that work well with each other. My experiences is that this works really great. Also, you can update or downgrade single libraries if you must by setting just a property in your build file. I wouldn’t recommend it for the Servlet API, but for example changing database drivers etc. A nice wow effect are the new devtools in upcoming Spring Boot 1.3. They provide a simple but powerful class swapping mechanism and an implementation of the LiveReload protocol. Cannot wait to try them out (as it happens, I’ve upgrade a new application of mine to 1.3.M5 to test the new jOOQ integration). The DevTools will go out of the way if you’re using a JRebel license or Spring Loaded, which is great. At the end of the nice tour de force, Stéphane pushed the app to Pivotals Cloud Foundry without any changes to the build or code. If you never used Spring, the talk had a lot of things to show. If you’re long time Spring user, you would be impressed how easy it has become since 5 years ago to deploy a Spring application. And for me, a long time Spring user and early Spring Boot adopter, it was nice seeing a concise presentation of what is possible. If you like those talks in your area: Speak about it, blog about it. Invite colleagues. Maybe leaf an Euro or two in the tip jar, so that we can provide you with a nice experience (drinks etc.). Come to the monthly meet up in Bar Elementa in Aachen, meet fellow developers. Don’t be afraid: Even if we blog in English and announce the talks in English, most of us speak German. But we strive to be open for all people in the Euregio and also want foreign speakers to have a clue what’s going on here. 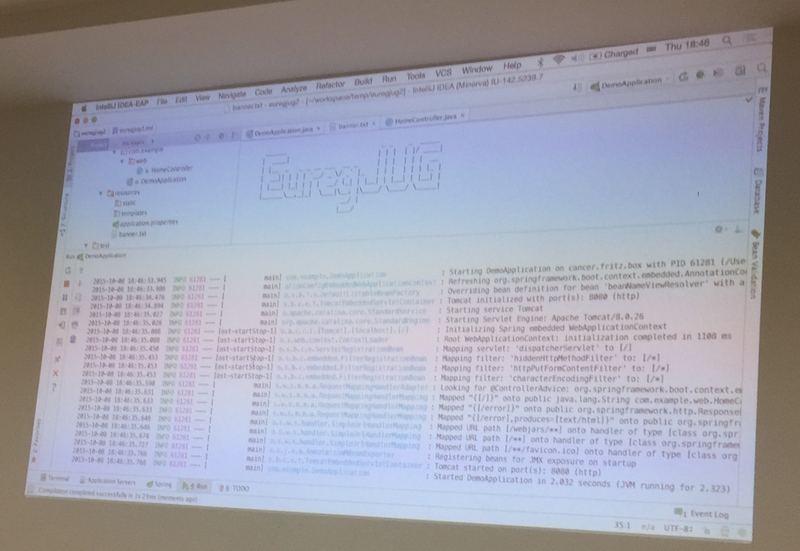 This entry (permalink) was posted on October 9, 2015 at 9:58 AM by Michael, tagged with EuregJUG, Spring Boot and categorized in English posts, Java.